Sir Geoffrey Ingram Taylor in 1964 made the Taylor cone. His main interest is to see the effect of water droplets in electrical fields (e.g. why water might have a certain shape if there is a lightning strike). To test this he made the right dimensions for a cone for small amounts of water to flow out. It is basically a cone with convex sides a rounded tip and a hole that allow water to be pushed out of it. Nothing interesting so far (especially now since we have seen many of these cones on different products). The interesting thing is when you apply a electric threshold voltage around this cone. 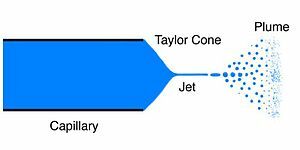 The term Taylor cone can specifically refer to the theoretical limit of a perfect cone of exactly the predicted angle or generally refer to the approximately conical portion of a cone-jet after the electrospraying process has begun. The surface tension of the water is key in this as it is holding the individual droplets together to make a cone. When the water is exposed to an electric field it starts to deform in shape caused by the exposure the surface tension alone. To make the perfect cone the shape of the outlet tube has to be the correct dimensions. Two assumptions were made to achieve this: i) the surface of the cone is equipotential and 2) as well as a particular radius to counter the surface tension to produce the cone. When a certain threshold of voltage has been reached the slightly rounded tip inverts and emits a jet of liquid. This cone jet is the beginning of the electrospraying process. The electrospray process one of the key developments in Mass Spectrometry. In order to record the masses of individual molecules you need to get this mist to smaller and smaller droplets (droplet fission) until only the solvent and molecule are left. After pumping the solvent out using a vacuum, only the molecules of interest are left. And then you can detect them. The electrospray technique was later described by Dole and later by Fenn to produce the electrospray ionization technique.